Happy Spring! Happy St. Patrick’s Day! It may still be cold and rainy but the sun will shine soon and our pot of gold will appear! 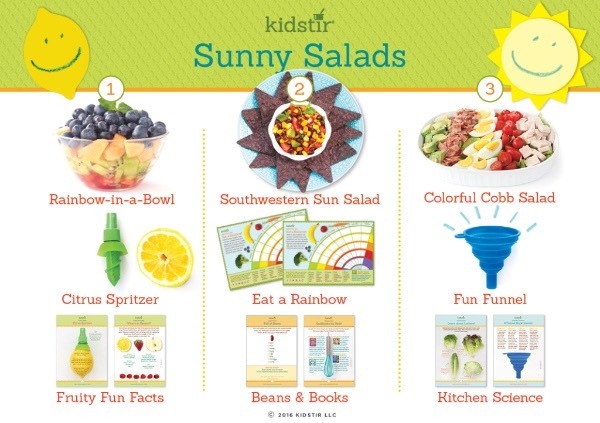 Let’s will it into happening all the sooner by enjoying the March Sunny Salads Kit! We know salads are great for you, but can they be absolutely delish as well? Yes, yes, yes! And I promise your kids are going to feel the same way after this month’s kitchen adventures! Before you get going, check out our Salad Making Tips with Kids. Rainbow-in-a-Bowl Yummy! I love this simple and healthy recipe as a way to bring kids into the world of salads. Kids love fruit so let’s start with that! Kids will get practice measuring, chopping, snipping herbs, making a dressing and very importantly, learning how to deliver a creative presentation. This is also a great way to teach kids about different seasonal fruits. I love walking the farmer’s market with my boys, tasting samples, talking about flavors and how the freshest, most local fruits are always the tastiest. Once your junior chef have got the honey-lemon-mint dressing down, try our delish Poppy Seed Dressing for your next fruit salad! And hey, want to make a fruity St. Patrick’s snack that is cute and healthy- check out our Kiwi Clovers. Southwestern Sun Salad I know my kids can sometimes think salad = lettuce, but here’s a salad that proves otherwise, deliciously! If you’re craving Mexican, it’ll hit the spot with beans, veggies and tons of flavor. Serve it with store-bought chips or make a healthier baked version with our homemade chip recipe. Don’t forget to garnish with freshly cut avocado -yummy! Use our handy instructions to teach your little chefs how to cut avocado. Once you taste this recipe, you’re likely to get a hankering for a full Mexican meal, so go ahead, pick up our Taco Truck Fun single kit. This kit is extra to the subscription (it’s not one of the core 12 kits you’d normally get with your membership) and will not disappoint with it’s outstanding appetizer, main, and dessert recipes! Colorful Cobb Salad Hard boiled eggs, lettuce, cheese, turkey and bacon!!!! Cobb salads rock! This is a great salad for kids to learn to make. It’s filled with foods they typically love to begin with but combines for a nice balance of protein and veggies. I love this salad for a hearty dinner, but this also makes for a great school lunch. For a little razzle-dazzle in the lunch box, dress up the eggs like Spring Chicks! Not only is this salad tasty, it looks so pretty too when the ingredients are neatly laid out in beautiful rows. The kids will love it, as will you! Now, let’s check out the great tools that come with this kit! Fun Funnel So cute, so functional, and so educational! The little silicone funnel in this month’s kit is such a handy tool to have at home. Not only does it fold up so it takes no space at all, it is made of silicone so can easily handle hot and cold substances. Easy to wash in the dishwasher too. Use it with this kit to teach kids to make their own salad dressings in a jar, and then use it again and again when pouring dry and liquid items from larger to smaller containers, and to do lots of fun kitchen science experiments. Eat a Rainbow Chart This beautifully designed chart has been a favorite since we opened Kidstir years ago. Parents, teachers, kids love it as a way to teach kids about different fruits and vegetables and make eating them into a fun game. If the chart in your kit is a hit in your family like it was with ours, print another Rainbow Chart out each week to keep the fun going. And if you’re on a roll, keep on going with our Farmer’s Market Hunt too! Definitely don’t forget to check out our super-popular family game Salad Charades. You will have a family meal to remember! 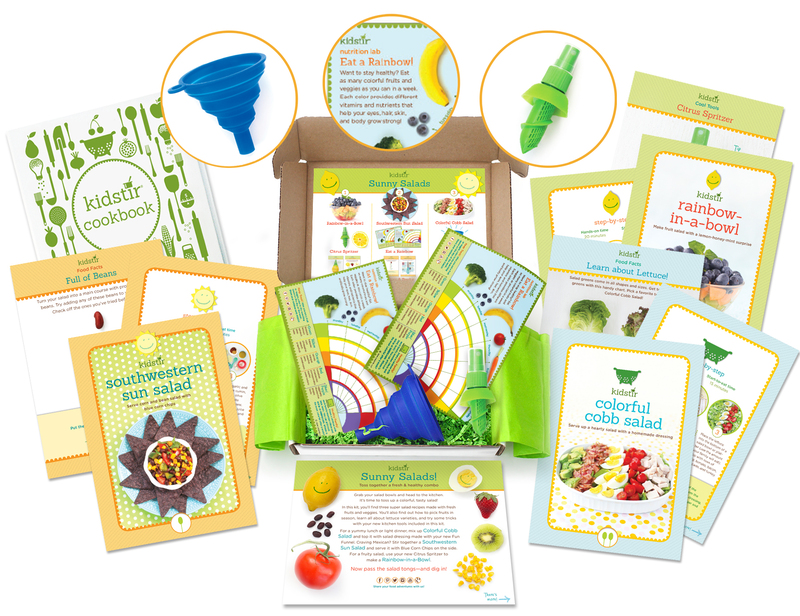 Check out our full collection of fun kids cooking games! Citrus Spritzer This is the tool that you never knew you needed. But try it and there’s no going back. So cool! This little spritzer turns your ordinary lime or lemon (or even other citrus) into a spray! Just warm up your fruit, roll to soften a bit, and pop this spritzer in. Then spritz away on a green salad, your chicken entree, or cut fruit (to keep from browning in lunch boxes) and more! You and your kids are going to have so much fun with this little pocket full of wonder. Besides the delicious recipes, there’s tons of foodie learning in this month’s kit: Cool Tool Citrus Spritzer, Farm to Table What’s in Season, Food Facts Learn About Lettuce, Kitchen Science 4 Funnel Science Experiments, Food Facts Full of Beans, Recipe Fun Cookbooks for Kids, Secret Ingredient Blue Corn Chips, Chef’s Secret How to Boil an Egg, Fun Food Rainbow-on-a-Stick. Your kids will learn, but I bet you’ll pick up a couple of new tricks and facts too! Plus, check out our great recipes from our DIY page and keep the salad love going all month long. Our Sunny Quinoa Salad and Strawberry Spinach Salad recipes will knock your socks off!